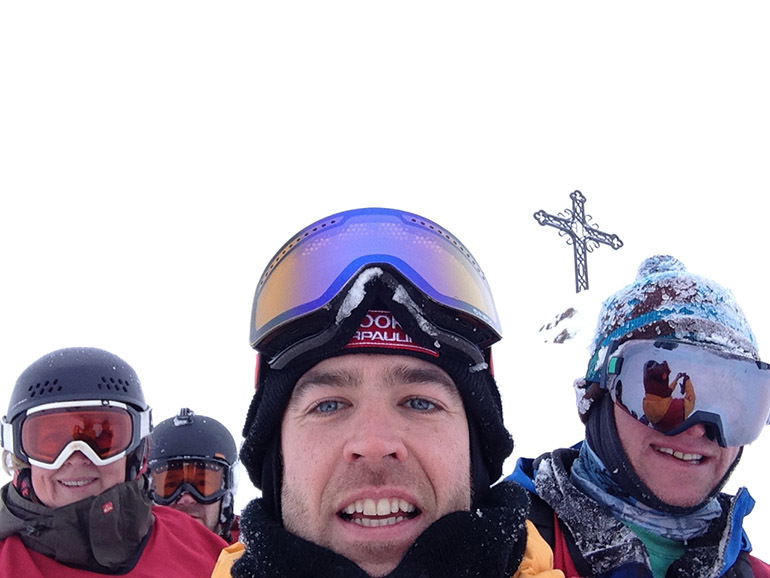 Snow Camp 2014 – Team Mountain Mavericks, full report! The word ‘Endurance’ was never really spotted on the promotional Snow Camp Flyer, we just jumped in feet first, after such a great cause. For Mountain Mavericks it was more about raising a great amount of cash to inspire disadvantaged young adults to grow in confidence and self esteem whilst making the right choices for their lives – all through the amazing sports surrounding the mountains. 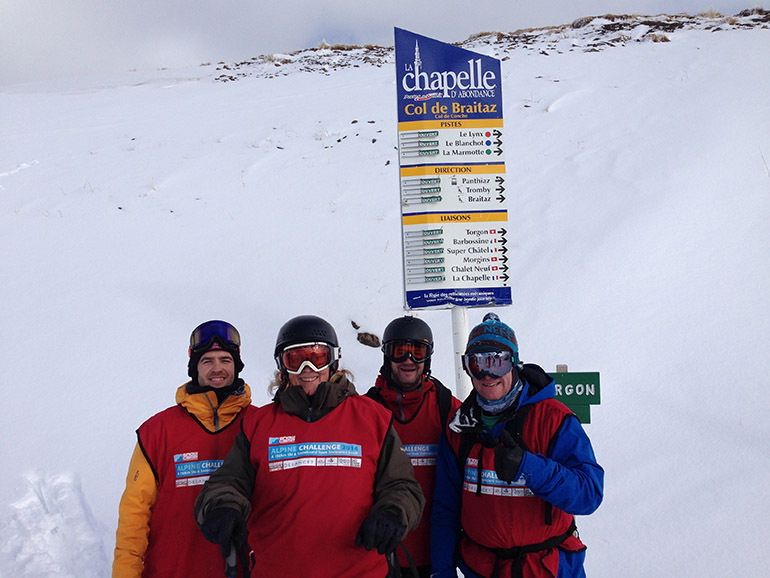 As it turns out, the challenge was tough, competitive, exhausting, exhilarating, emotional…………………………..
We started off the fund raising back in November, by hosting a 2nd hand ski and snowboard sale at the hotel, where the €10 charge per table turned into €150 raised. We were off to a good start! In the run up to the event we raised an enormous amount all from the amazing donations from our guests, friends and family. Thank you to all of you. The really event started on the Wednesday when the list of check points and basic rules were released. This launched a route planning discussion, given our local knowledge we were pretty confident in our plan, though some questions needed to be asked in order to understand the full limitations of the rules. That opportunity came the next evening at the pre event briefing. This was also our first chance to meet the other teams, and listening to the discussions, started to realise we weren’t the only ones who’d been planning. There is so much good about this event from the onset and especially into the action itself. But day 1 also coincided with our first powder day of the season and I can’t deny there was some emotional tugging as we raced past many favourite places looking the best they had since last year and not being able to leave our tracks. Though I cannot complain really, we were on first lifts, in great conditions with a good crew and a mission to do. Our plan for day one was to cover all the checkpoints in a route loosely following the Portes de Soleil tour, which meant we very quickly got away from the central resorts and were charging fresh groomed pistes all to ourselves. We visited areas which were for some of our team was the first time, Olly even went on a chair he had never been on before and this is his 10th season here. By lunch we were heading back from the furthest point, we were happy with our progress though slightly bummed that a necessary chair was closed and having asked the pisteur was likely to open tomorrow which might mean a return trip to Torgon. Though despite Cinda suffering new ski boot syndrome we were still in good spirits. The end of the day had seen us manage 14 checkpoints, but the endurance part had started to kick in, especially as we got back towards Avoriaz and the pistes were occupied, pretty lumpy and our legs were all feeling it. We made it back to the hotel all good (if slightly broken), though only with just enough time to take stock get changed and set off on the night hike. The hike was in equal measures loved and hated. It was great to be walking in the mountains, it was dark, quiet, fresh snow, the lights of Morzine on display at the bottom of the valley and a great group of people. However to do it after a huge days riding with no break, definitely took the skip out of your step (the hipflask helped that a little though). We were again reminded it was an endurance event, but it was the next stage that really drummed the challenge part home. Now so far it could be argued that everything we had been up to was essentially fun and it can’t be said that sledging isn’t also, but a sledging relay race is slightly different. Having just spent the last couple of hours discussing the day with other teams and finding out how everyone did, we were aware that it was all very close (10 km’s separated the top 6 teams) and quite competitive, which meant the race part could make a difference and was taken quite seriously. Out the back of the Hotel L’Aubergade there is a little beginner slope, perfect for sledging. What seems little however when you ski down it, is a totally different thing when you are trying to sprint up it. Lucinda was by now struggling and we had got it agreed that one of the other team could cover one of her runs (you had to do it twice), which was good for the team, but not so good for Hamish. After the sledging everyone was absolutely finished and all talk was of going to bed and how much we would all hurt the next morning. True to form day 2 started a lot slower than day one, but all teams were in place and ready (if not so raring) to go by first lifts. Unfortunately Lucinda, who had the day before achieved way more physically than she had done in a good number of years, was suffering badly and it was decided that it would not have been healthy to continue. So as a three our plan today to tackle the shorter loop round les Gets, then return to Torgon to get the one we missed the day before. It seemed a popular plan as 6 teams (most of whom were in the top group) were all waiting in the queue for the Pleney to open. One advantage of Cinda being back at base camp was getting constant reports on everyone’s progress. To the degree of at one point realising that some teams, who may not have been going so fast, were gaining about a km a run on us just by doing big turns down the pistes, rather than straight-lining everything. Our tactic of going as fast as we could did mean however that we were the first to reach Torgon and were the first team to bag all the checkpoints. Which meant it was now all down to maximising our kilometerage in the remaining time. We decided that the new 3S Prodain gondola in Avoriaz gave the quickest uplift time compared to distance and set about lapping as best we could. There was another reason for choosing the 3S, in that on a Saturday because it transports people accessing Avoriaz it stays open till midnight and we were hoping to snag a few extra runs in, however we are not as clever as we think and by 4 o’clock half the teams were doing the same. It was about this time that Dan and the girls back at HQ realised what we were all up to and announced that distance recording would stop at the usual lift closing time of 5. So that was it job done and even with Lucinda monitoring closely, it was too close to call and none had any clue as to the top 5 positions. A couple of hours later we were all refreshed (or at least clean) and grouped together for the prize giving announcement. All hints of competitiveness had gone (actually been gone since we all ended up on the same bus after the last run) and there was just that great feeling of camaraderie which is slightly individual to skiing and snowboarding. Which really reminded us, it is this experience that the guys at Snow Camp have been able to tap into and use to enhance and improve the lives of kids that would otherwise be much worse off. Which in all brought it full circle as to why we were all there, to raise money and awareness for a great charity. It was a razor sharp finish – Team Mountain Mavericks completed all the check points as did the other local team, Morzine Source – MM tracked 312KM and MS 313KM…..well done to MS guys! Which only leaves us to say thank you so much for all who put such efforts into a great event and we would recommend everyone to get involved next year, but I would make note to read the title carefully as it is not just a team ski event, the words challenge and endurance are there too. Next: Recipe of The Week – Chocolate Fondant with Vanilla Cream!